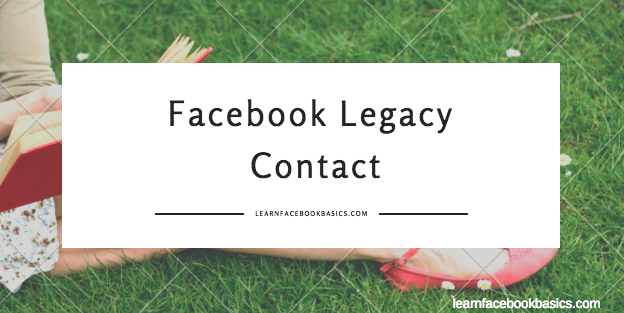 How to Choose a Facebook Legacy Contact | Choose Your Facebook Legacy Contact- Choosing a Legacy Contact can be the best decision you make concerning your Facebook account because it simply tells Facebook to either delete your account or memorize it when you are gone. Death is inevitable - true but hard to believe! You need to make a smart move to choose who you want to manage your Facebook account when you pass away. See: How to Hide Your Facebook Friend List from Friends and Others. In this article, we'll see how to choose a legacy contact, how to memorize a Facebook account. What happen to your Facebook account if you pass away? You can tell Facebook in advance whether you’d like to have your account memorialized or permanently deleted from Facebook when you are gone. Depending on the privacy settings of the account, friends can share memories on the memorialized Timeline. Content the person shared (example: photos, posts) stays on Facebook and is visible to the audience it was shared with. If you'd like to create an additional place for people on Facebook to share memories of your loved one, we suggest creating a group. Learn how to request the memorialization of an account or how to request the removal of a deceased person's account from Facebook. How to add, change or remove legacy contact on Facebook? You can add, change or remove your legacy contact in your account's General Settings at any time. To change or remove a legacy contact, follow steps 1–2 above, then click Remove. From there, you can add a new legacy contact if you'd like. If your account is memorialized, your legacy contact will be notified. Note: You must be at least 18 or older to select a legacy contact. Can I choose someone who isn't a Facebook friend as a legacy contact? At this time, you can only add a Facebook friend as your legacy contact. You can't add friends who ain't on your list. How can you deactivate your Facebook account now? How do I log out of the iPhone or iPad app? How can you see who is following you? Change your password- secure your account now! How do you deactivate your Facebook account? How Can I change My last name on Facebook?